From reading a simple Ryanair in flight magazine article I’m now signed up for one the world’s classic and iconic bike rides at the beginning of October this year. The L’Eroica is an organised ride in the middle of the Chianti region in Tuscany, Italy which was established with the specific intention of saving the famous Strada Bianchi (white gravel roads) which are synonymous with that area of Tuscany. So if you are interested in an international sportive with a difference, food stops with the classic cycling staples of red wine, cured meats and focaccia then this is the one to do. There are 3500 riders taking part this year, all of whom will have to ride a bike made before 1983. A recent rule change a few years ago, to keep the whole event in line, with the retro feel and approach to the event restricted the bikes that can be used to ones manufactured before 1983. So no index shifting, 6 speed cassette at the back if you are lucky and maybe twin chainrings up front. I’ve spent some time surfing ebay UK for a classic Italian retro racer, with no real success. 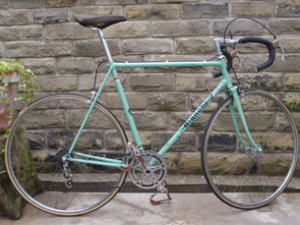 So I tried ebay IT and came up trumps with a 1974 / 75 Bianchi 10 speed racer from a chap in Rome. I went over to Italy at Easter to collect the bike (moves current bike count up to 6 now) and have a holiday of course. 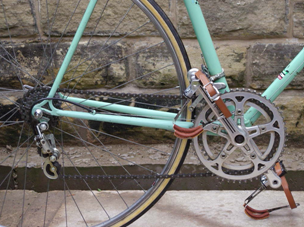 Spare cables, spangly new cable cutting tool, new chain etc etc and didn’t need any of it. The tubular tyres pumped up and held air, only restriction was a seatpost that was only 120mm long, gearing is of the epic variety, 52 / 42 chainrings with a 5 speed 12 / 23. I can tell you its no compact. I must send out massive thanks to both Marco for his fantastic help with the whole logistics of bike delivery and collection at Easter. Thanks Marco you are a star, also Alex at Bicicletta, who has been great at answering daft & odd questions both before getting the bike and then even more since picking it up. Only a few more things to sort before October, I need to get my rear in gear and put some miles in so I’m ready for the 200km I’ve signed up for (there are shorter distances but I’ll be in La Squadra colours so there are standards to maintain ! ), grow a moustache for the full retro feel and learn how to fit tubular tyres in as shorter time as poss. I’m aiming for a sub 12 hour time, which from what I read is seen as heroic standard. After some roadside learning on how to fit tubular tyres on the hot 100 I tried to find some vintage wheels which took tyres and tubes. Success again on ebay, with some mavic G40 rims on record hubs plus a 5 speed set of rear cogs with a 14 / 28 set of ratios, these are now on the bike and in the unlikely event I tackle curbar before taking the bike back to Italy it should be a breeze! !